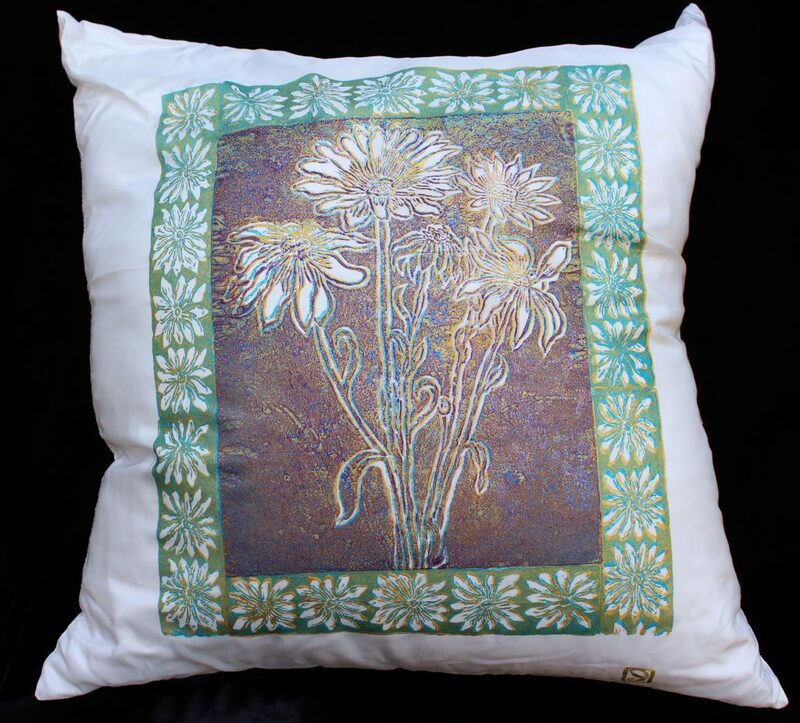 Pillows may have slight texture due to the metallic inks; however, they are permanent. 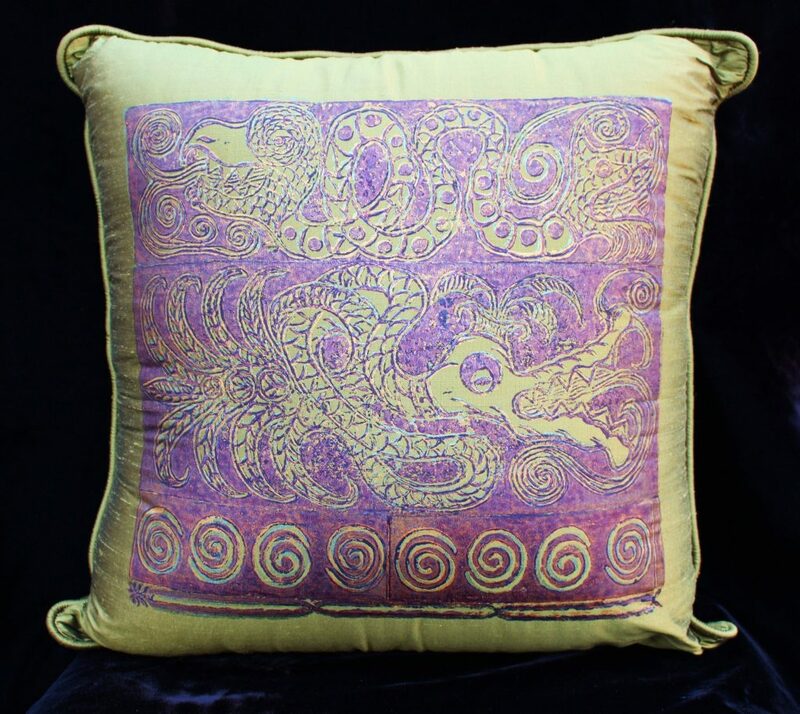 “Feathered Dragon & Gemini Dragon” are a one block print of Aztec gold, and purple on slub silk pillow . Color may also vary due to light on metallic inks. 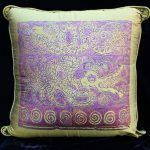 Hand wash, do not rub, iron on wrong side, wool setting, also can be dry-cleaned. Please call if any questions: 831-425-8430. 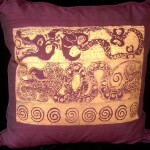 Lino-cut print on maroon slub silk . 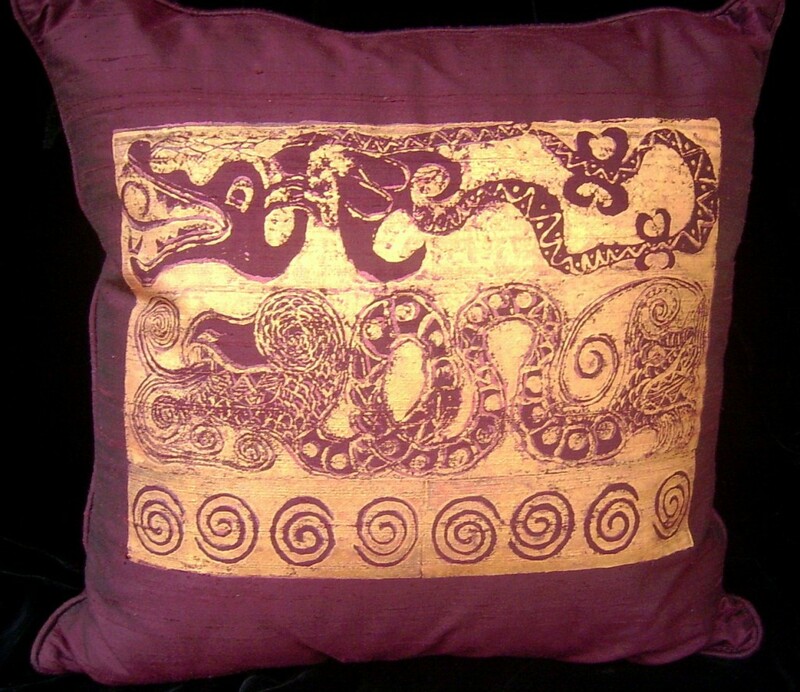 “Gemini and Early Dragon” is a two block process printed with red Jacquard textile ink and overprinted with Aztec gold. 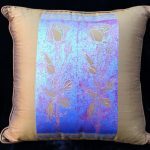 Pillows may have slight texture due to the metallic inks; however, they are permanent. “Stemmed Rose” is a one block lino-cut print of Sky Blue and Aztec gold on bronze slub silk. 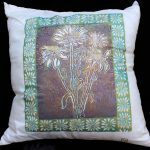 (18″ x 18″) Color may vary slightly due to light on metallic inks. Hand wash, do not rub, iron hovering with steam, wool setting, also can be dry-cleaned. Please call if any questions: 831-425-8430. 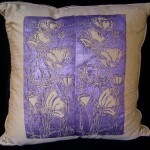 Lino-cut print on grey slub silk . 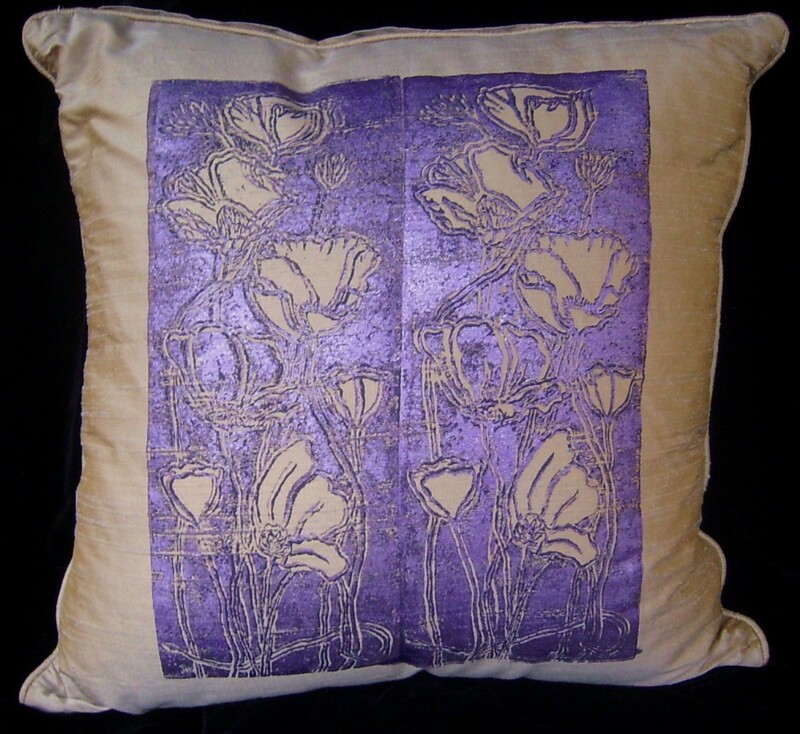 “Tulips and Poppies” is a one block process printed with black Jacquard textile ink and overprinted with metallic purple. 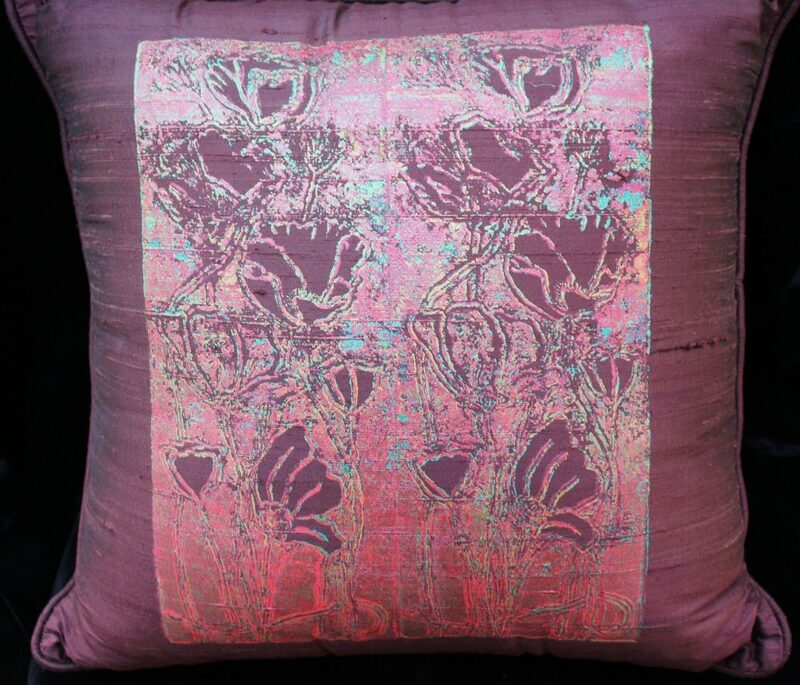 Pillows may have slight texture due to the metallic inks; however, they are permanent. 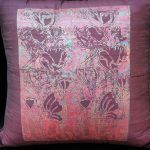 “Tulips and Poppies” is a one block lino-cut print of metallic emerald green, red, and Aztec gold. (18″ x 18″) Color may vary slightly due to light on metallic inks. Hand wash, do not rub, iron hovering with steam, wool setting, also can be dry-cleaned. Please call if any questions: 831-425-8430. 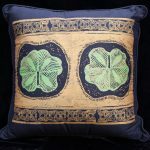 Lino-cut print on bright green slub silk . 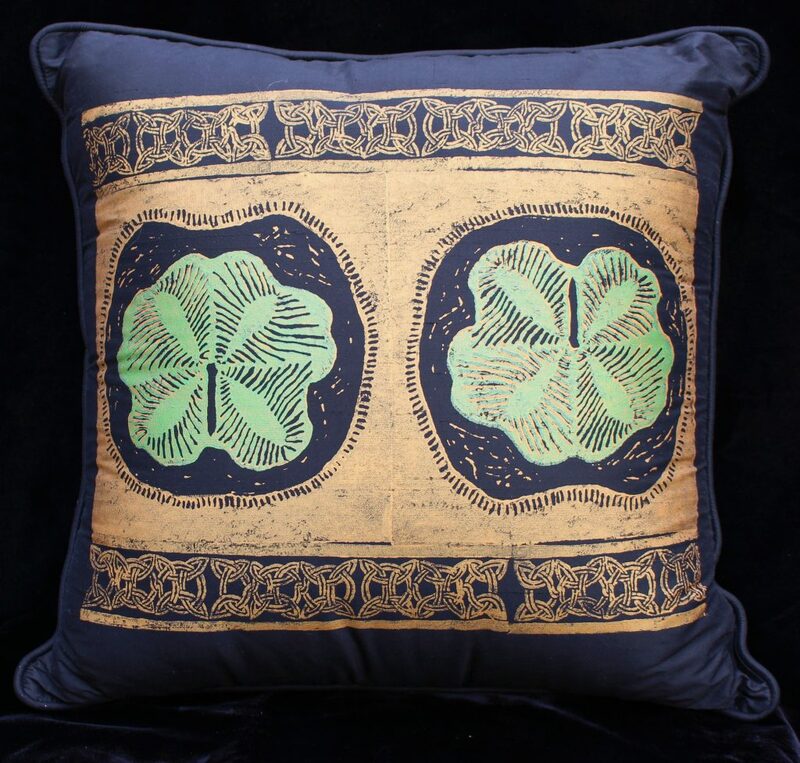 “Two Dollars” is a one block process printed with bright green Jacquard textile ink and overprinted with Aztec gold. Second printing is the border with Aztec gold .